CULVER CITY, Calif. (AP) — A 34-year-old professional sports gambler from Las Vegas won more than $110,000 on "Jeopardy!" on Tuesday, breaking the record for single-day cash winnings. LOS ANGELES (AP) — The first-ever "Jeopardy!" team championship came down to a clash of the titans, Ken Jennings vs. Brad Rutter. HERSHEY, Pa. (AP) — Pennsylvania's Democratic governor and his Republican challenger met in their only formal appearance together in the fall campaign, in which moderator Alex Trebek of "Jeopardy!" fame needled the candidates on their mudslinging and pressed them on their perceived exaggerations. The event, billed by Trebek as conversational and not a debate, showed that Trebek had read up on Pennsylvania's issues and politics in drafting questions for Gov. Tom Wolf and GOP nominee Scott Wagner. LOS ANGELES (AP) — Alex Trebek sported a beard as he launched the 35th season of "Jeopardy!" and the look has led to a poll. With an audible gasp from the studio audience and most of America, Thursday night's "Jeopardy!" featuring Hempfield native Sarah Norris ended in a tie. "I'm sorry, Governor, but you forgot to phrase your answer as a question," probably won't be something voters hear at the PA Chamber of Business and Industry's gubernatorial debate, despite the organization's Tuesday announcement that it would be moderated by Alex Trebek. 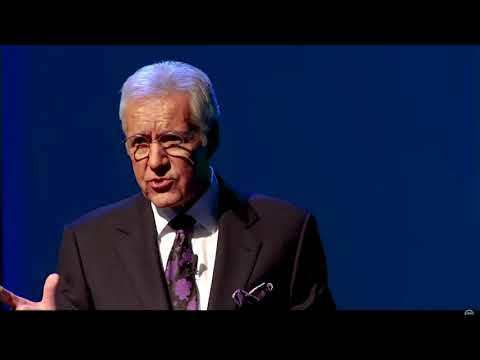 Trebek, longtime host of TV quiz show "Jeopardy," will headline the chamber's 34th annual dinner on Oct. 1. Organizers say that since 2002 the dinner has included a 45-minute debate as part of the evening's program. LOS ANGELES (AP) — He played a boy who does nothing but watch TV and wears cowboy clothing in the 1971 movie "Willy Wonka and the Chocolate Factory." Who is "Jeopardy" contestant Paris Themmen? Themmen appeared on the game show on Tuesday. But he didn't tell Alex Trebek about his role as Mike Teevee when the host asked him about himself. Themmen said he was an "avid backpacker." This state produces the smartest ‘Jeopardy’ contestants ... What is Minnesota? If it seems like theres been a steady stream of Minnesotans competing on Jeopardy lately, its not your imagination. And if it seems as if our neighbors have been winning big when they get on the show, thats accurate, too. Weve had three Minnesotans turn up on the game show in just the past few weeks, with one of them Rob Worman from Edina racking up six victories in a row and $133,901 in winnings in mid-February. Trebek will keynote the Pennsylvania Chamber of Business and Industry's annual dinner coming up in October, which is scheduled to include the 45-minute debate as well. Democratic Gov. Tom Wolf will face off in November against the winner of May's Republican primary. The 34th chamber dinner will be held Oct. 1 in Hershey. Trebek will talk about his more than three decades as a quizmaster. Let's try "game-show hosts playing at politics" for $800, Alex. Longtime "Jeopardy!" host Alex Trebek will moderate a gubernatorial debate in Pennsylvania on Oct. 1, the Philadelphia Inquirer reported Wednesday. Mr. Trebek, 77, will appear on the stage at the Hershey Lodge in Dauphin County with incumbent Democratic Gov. Tom Wolf and the winner of the GOP primary that includes state Sen. Scott Wagner, attorney Laura Ellsworth and businessman Paul Mango, a former Army Ranger. In 2012, longtime Jeopardy! host Alex Trebek admitted he would have loved to have been one of the questioners at a presidential debate between President Barack Obama and Republican presidential nominee Mitt Romney. During the 2018 election cycle, he’s getting his wish. Sort of. With the Super Bowl right around the corner, Thursday night’s episode of “Jeopardy!” tried to bring some football knowledge to the screen. However, much to the surprise of host Alex Trebek, none of the contestants were having it. Take it easy, Trebek. Not everyone is a football junkie. "Jeopardy!" host Alex Trebek pulled no punches when contestants on Thursday night's episode of the quiz show had no clue about football. None of the three contestants buzzed in to even attempt to answer the series of five questions in the category "Talkin' Football." It became painfully obvious they didn't know anything about football"
A St. Paul woman’s previously recorded appearance on television’s “Jeopardy!” aired Friday, and she came away with cash winnings in the four figures, albeit barely. LOS ANGELES (AP) — Longtime "Jeopardy" host Alex Trebek had surgery for blood clots on the brain, but assured fans he'd be back reading clues to contestants soon. Trebek appeared in a video on the "Jeopardy" Facebook page Thursday to announce that he'd had the surgery during the show's holiday break. Brandy Bresenhan lives and breathes trivia. The 42-year-old housewife met her husband, Brad Craig, 50, at a trivia night a little over a decade ago. When Hurricane Harvey struck Houston, flooding their Meyerland home with almost a foot of water, they were in New Orleans competing in the prestigious Trivia Finals Challenge. So when she got the call to come in for an in-person audition for the iconic quiz show "Jeopardy!" on Friday in Houston, she didn't hesitate to push the buzzer. Answer: The original host of Jeopardy! Gail Ansheles would buzz in here: Who is Art Fleming? Well before Alex Trebek took his place at the host’s podium, before Jeopardy! grew into an American institution, Ansheles was a die-hard fan, watching the early Fleming-hosted version of the venerable game show as a youngster in Ridgewood, N.J.
Ansheles’ family even had a low-tech board-game version of the answer-and-question game in the house. LOS ANGELES (AP) — A woman who competed on "Jeopardy!" while battling terminal colon cancer has died the week before her episode was set to air but prize money has gone to cancer research as she wished.